The Libraries’ information literacy (IL) campaign dubbed as IamInfoSMART, on its third year, continuously aimed at honing students’ IL skills and raising their awareness on the importance of IL in their pursuit for academic and research excellence. This year’s week-long fair of exhibitions, learning sessions, and interactive games was held on 03-07 November 2015 at The Learning Commons, Henry, Sy. Sr. Hall. 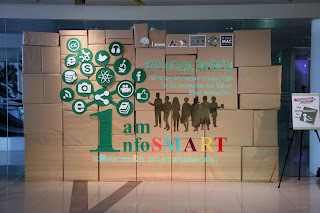 With the theme "Done Searching, Now Sharing: Advancing Information Literacy Skills for the Responsible and Ethical Use of Information", IamInfoSMART 2015 puts emphasis on the R(efer information sources correctly) and T(reat and apply information ethically) information literacy skills of the InfoSMART framework. The opening ceremonies on 03 November 2015 which was graced by DLSU’s Associate Vice Chancellor for Academic Services, Ms. Kai Shan L. Fernandez and invited keynote speaker Prof. Paul Nieuwenhuysen of Vrije Universiteit Brussel kicked off this year’s IamInfoSMART Week. Ms. Fernandez, in her welcome remarks, emphasized the importance of advancing IL skills by teaching the researchers on how to use information responsibly and ethically. Prof. Nieuwenhuysen, in his keynote address, presented his paper entitled, "Information literacy didactics: 12 pitfalls, bottlenecks & challenges" which enumerated the issues and problems encountered in teaching IL and suggested a number of ways to improve didactics in this area. Another highlight of the short program was the launching of the Online IamInfoSMART Goes Mobile. Mr. Yugosto Balbas, Systems Services Librarian, who designed the mobile website, introduced the interface and demonstrated the steps in installing/bookmarking the mobile app. To further promote this new service, freebies were given to patrons who showed the installed Online IamInfoSMART mobile app on their mobile devices. The ribbon cutting and opening of the multi-media exhibit signalled the commencement of the IamInfoSMART 2015. This year’s exhibit featured six infographics on referencing and plagiarism, the online IamInfoSMART website, and a total of seven fun and exciting daily games, namely: How InfoSMART Are You?, Heads Up!, Digital Pictionary, IamInfoSMART Land, Supersized Jenga, Giant Pacman, and Press to Play Nook. 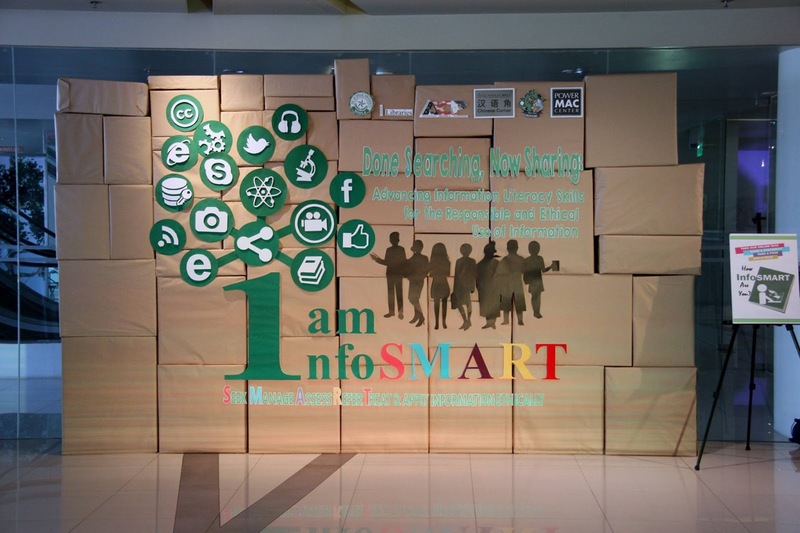 A total of 468 students, faculty, and visitors joined and played in the IamInfoSMART 2015 multi-media exhibit which ran from 03 to 07 November 2015. Are you a novice, apprentice, adept, or master? Know your IL level by taking our online quiz. Make a statement. Take a pose. Win a prize! We sure would like to test your knowledge in Seeking for the right information! Get a partner and play our customized information literacy deck in Heads Up! Better in expressing thoughts in graphic form? Draw and guess the terminologies related to Managing retrieved information effectively in our Digital Pictionary. Wanna meet LORA and friends? IamInfoSMART Land introduces you to the Library Online Reference Assistant and the other 7 members of the League of Information Assistants as you answer questions related to Assessing information critically. Setting up the Jenga tower (and watching it crash down) is fun, but a supersized version is indeed more exciting! With corresponding questions on Referring information sources correctly for each Jenga block you take from the tower, the challenge is just so real. Dress up as the Giant Pacman and gather as many fruits as you can! Each fruit scattered in the Pacman Maze has a surprise inside it - a question related to Treating and applying information ethically you’ll need to answer. Play any or all of three online games related to referencing and plagiarism to win a prize! To reach more library patrons, the Face-to-Face with RIA (Roving Information Assistant) service of the Libraries was put in the spotlight during the IamInfoSMART 2015 as RIA sets up her Research Help Desk on 4 November 2015 at the Exhibit Area, The Learning Commons, 6F HSSH. Similar to the concept of “book-a-librarian”, Face-to-Face with RIA is available for a 30 to 60-minute, one-on-one instruction on topics such as formulation of search strategies, subject database searching, evaluating sources of information, referencing, citation management tools, and Turnitin. A total of eight undergraduate students from the Ramon V. del Rosario College of Business (RVR-COB) and Gokongwei College of Engineering (GCOE), and one faculty from the Management and Organization Department participated in this special library instruction session with RIA. All participants were granted with the following special library privileges: activated MyLibrary account during Christmas Break 2015; additional borrowing privileges, specifically, borrowing of up to 4 reference books for 3 working days (should be availed of within T2 of AY 2015-16); and, extended use of discussion room of up to 3 hours per booking (regular is 2 hours) for the entire T2 of AY 2015-16. 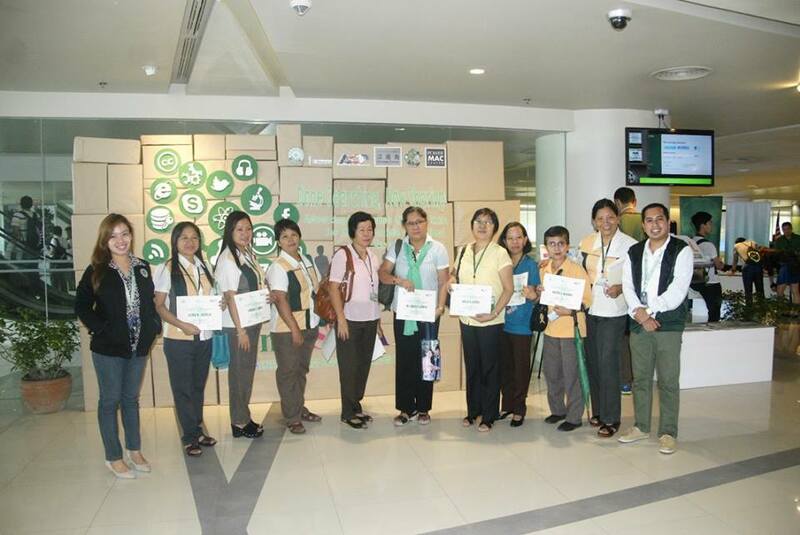 On the fourth day of the IamInfoSMART 2015 (06 November 2015), DLSU librarians and staff were given the chance to play, learn, and win in an exciting game that gauged their knowledge and understanding on the social, ethical and legal issues of information use. Four groups composed of 13 librarians and three library staff from the different library units competed for the top spot in the Please Cite It Right!, a game for librarians. players were asked questions related to referencing/citation, plagiarism, and copyright. In Let’s Cite It!, the contestants were tasked to identify what type of citation was flashed in the screen. Guilty as Charged, on the other hand, tested each group’s knowledge on the different types of research misconduct violations (e.g. patchworking, falsification, self-plagiarism, misquoting, etc). With the highest accumulated points at the end of three rounds, Team LORA won the championship. This team is composed of Minette Vinzon (Readers’ Services), Cynthia Cordova (Technical Services), Agnes Barsaga (Technical Services), and Jorge Rada (STC Libraries). Team TOM members Carlo Uy (Technical Services), Lulu del Mar (Archives), Avelino Dancalan (Systems Services), and Jojie Gonda (Technical Services) finished second. Marita Valerio (Technical Services), Joseph Yap (Instructional Media Services), Justina Garcia (Technical Services), and Yugosto Balbas (Systems Services) of Team SciTRA were the third placers. Lastly, Lorie Laxa (Technical Services), Purisima Fernando (Archives), Vivian Soriente (Readers’ Services), and Karen Natividad (Technical Services) of Team RIA ended up in the fourth place. While gauging the library personnel’s information literacy skills, this activity also aimed to promote teamwork, camaraderie, and sportsmanship among librarians and staff through competitions. 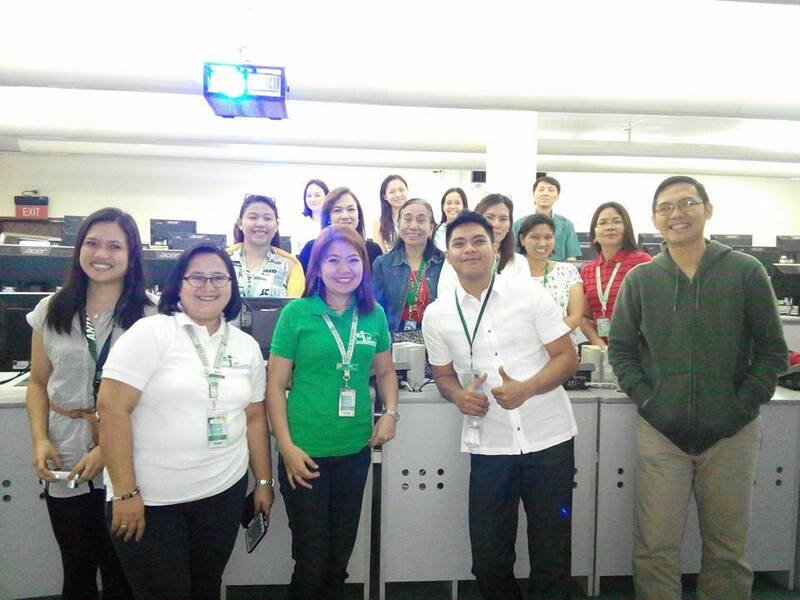 As part of the Libraries’ community extension program, nine (9) teacher-librarians from the Department of Education – Manila District 1 and nearby areas attended the free mentoring program called TeachMeet with LORA, the Librarian. 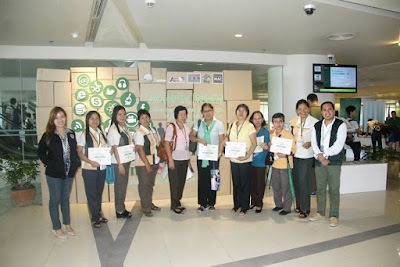 This activity was attended by teacher-librarians from Rosauro Almario Elementary School, Fernando Ma. Guerrero Elementary School, Amado V. Hernandez Elementary School, General Miguel Malvar Elementary School, Aurora A. Quezon Elementary School, Manuel L. Quezon Elementary School, Timoteo Paez Elementary School, Jose Rizal Elementary School and Antonio J. Villegas Vocational High School. Facilitated by Mr. Joseph Yap, IMS Coordinator, participants were taught to create library guide as a tool for library promotion and teaching students information literacy skills. In addition, the Archives Coordinator Ms. Donna Labangon gave a demonstration on how to access the e-Library USA databases and selected open access electronic resources linked via the Libraries’ website. This event is in close collaboration with the American Corner – Manila. submitting research papers for originality checking using Turnitin. Attended by five faculty members and eight graduate students, the workshop was facilitated by Pio Salvador Ramon Omana of Elsevier and Willian S.A. Frias, Readers’ Services Librarian. In his lecture, Omana showed the participants how to compare and select high impact journals using Scopus and manage documents and reference using Mendeley. Frias, on the other hand, helped participants create and manage their own Turnitin accounts. At the conclusion of the workshop, participants were able to identity peer-reviewed journals using Scopus as a user-friendly and reliable research tool for choosing where to publish their scholarly outputs. With the use of Mendeley, faculty members and graduate students can now effectively and efficiently store and organize cited sources; thus, improving their research productivity. Likewise, participants are now mindful of the responsible use of information as they generate Turnitin’s originality report and improve their writing skills. They also recognized that Turnitin is a useful tool to enhance their learning, teaching and assessment experience.